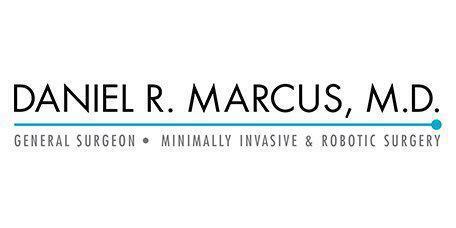 Dr. Marcus offers treatment for patients from West Los Angeles and Marina del Rey, California who suffer from issues relating to obesity using the latest in surgical and robotics technologies. If you are considering having bariatric surgery, you may be a candidate for minimally invasive da Vinci Surgery. There are a variety of bariatric surgery options available to patients from West Los Angeles and Marina del Rey, California including gastric bands, gastric bypass, and gastric sleeves. All procedures can be performed laparoscopically or with da Vinci technology. A gastric bypass is a surgical procedure where the surgeon works to bypass most of the stomach and small intestine so that the total amount of food that can be held by the stomach is significantly decreased. A gastric bypass reduces the space available in the stomach to the size of an egg and the limited capacity should signal to the patient that he or she is full much earlier. A gastric sleeve is a surgical procedure which removes about 75% of a patient’s stomach, greatly reducing the area available for food. Also, the stomach is responsible for producing the hunger hormone and by removing part of the organ, the remaining portion produces less of that hormone and the patient feels less hungry. A gastric band, also known as a lap band, is a small inflatable silicone band which is placed around the top portion of the stomach. This device creates a small pouch in the stomach, which limits the amount of food that can be consumed and the speed of eating. Instead of the large abdominal incision used in open surgery, da Vinci surgeons make just a few small incisions – similar to traditional laparoscopy. The da Vinci System features a magnified 3D high-definition vision system and special wristed instruments that bend and rotate far greater than the human wrist. These features enable your surgeon to operate with enhanced vision, precision, dexterity and control.